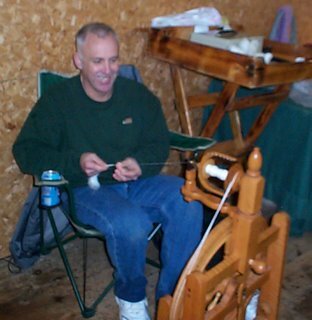 Full Service Yarn Shop: NH Sheep & Wool or Noah's Flood with fleece! 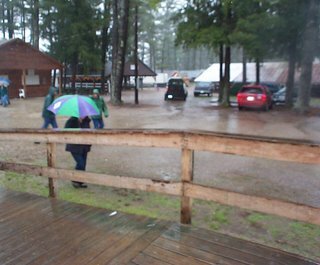 We had a great day at the New Hampshire Sheep and Wool Festival in spite of the torrential rain. 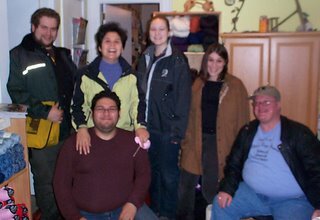 Here is our group ready to set out. From left to right: Alasdair, Silvia (Guido's mom), Katie and Amanda. Guido is kneeling and Jarrett is seated. Thank goodness Jarrett drove. I would have had a very hard time with the rain. 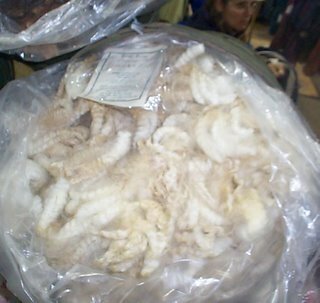 But inside there was fleece! 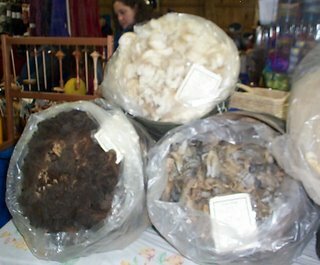 People weren’t just looking at fleece. 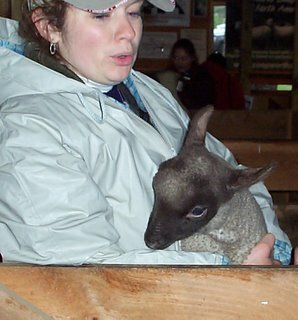 They were talking about fleece. 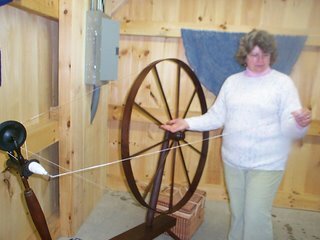 And, of course, spinning fleece. 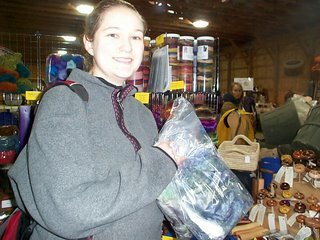 There was more there than just fleece, of course. Here’s Katie picking up a few things. I had to include this booth because it was just so beautiful. There was so much more like this that it can make your head spin (so to speak, hee, hee). 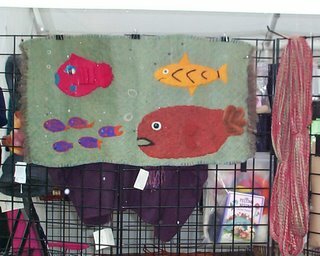 I also saw a beautiful and extremely appropriate felted wall hanging. 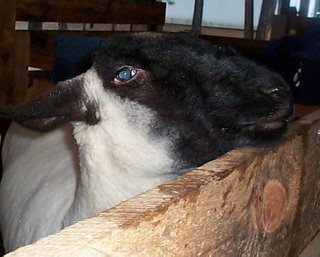 Ken owns Dorchester Farms. If you are looking for a really great angora bunny, Ken’s your man. 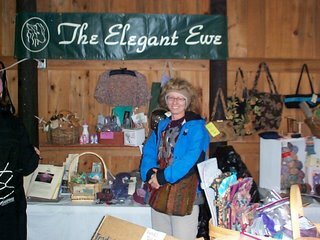 Marcie owns the Elegant Ewe and is going to be helping us out with the 2006 Boston Knit Out and Crochet Too. 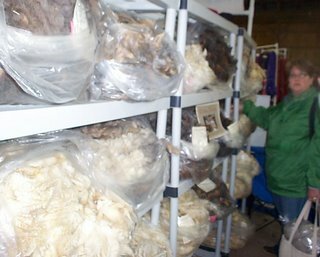 Mary owns Elihu Farm and most of the fleece pictures are her fleeces. 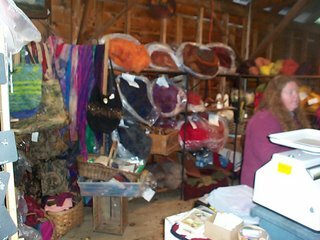 If you want excellent fleece, check her out the Mass. 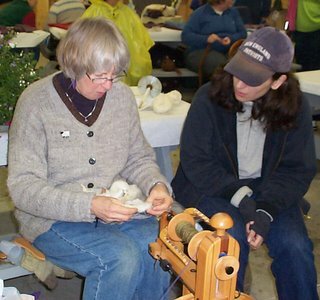 Sheep and Wool Festival. I’m pretty sure Ken will be there too. Not so sure about Marcie. My mission to get fleece was extremely successful. 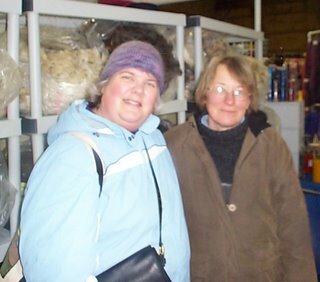 I bought two very dark fleeces and one light oatmeal colored fleece. With the help of Jarrett and Katie, my trusty fleece sherpas, I got them to the Zeilinger booth and sent them off to get washed and carded into roving. Of course, I forgot to get pictures of them. You’ll be able to see them as roving when they get back here sometime in August. 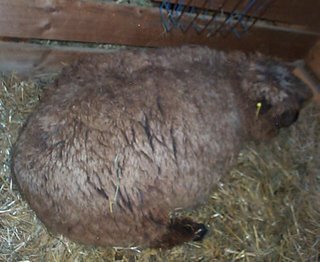 The big sheep was for sale (it may not look that big but, let me tell you, it was the size of a beached whale)! There was a number to call and everything. If only I could figure out a way to convince the City of Cambridge it was just a big dog. 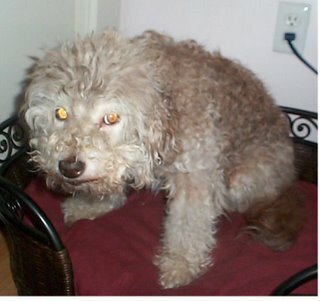 No wait, that’s my dog. Every time I take her picture, she seems to think she's naughty so they all look like this! 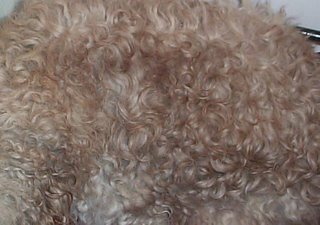 Miss Maggie is going to need some shearing herself soon (just waiting for warmer weather) and, no, I’m not going to spin it. Wow! That took a while to post! Hope you enjoyed it! Glad you made it there and back! The rubber boots were key. If I'd worn sneakers, it would have been a different story. 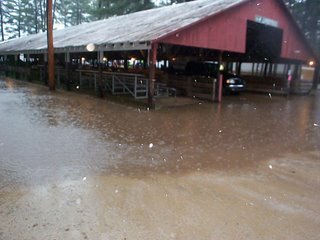 Also, I feel bad for all the outdoor exhibitors that got flooded out. I hope they got their money back! I'm so glad you like your yarn! It is a small world, isn't it.